After some light rain towards the end of yesterdays Giur-bheinn walk and during the late Sunday afternoon some people might have been worried how the weather on Islay would turn out today. The short answer is glorious. It was sunny, slightly cooler than the last two days. 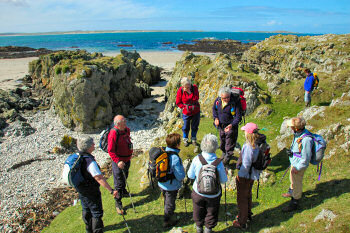 Excellent conditions for Iain MacPherson's walk at Killinallan to Gortantoid Point. 30 walkers met at Killinallan gate this morning to tackle this walk. 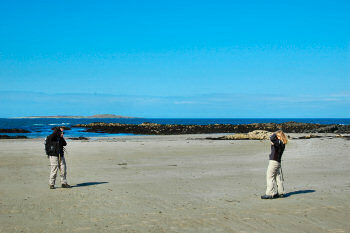 Almost immediately we left the track and dropped down to the beach, looking over to the seals basking in the sun. Following the dunes we walked north out to Killinallan Point, then turning east on to the long beach of Tràigh Baile Aonghais. 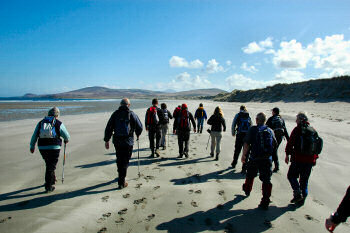 Two miles of beautiful sandy beach for 30 walkers, it was getting seriously crowded out there! It was so crowded some people started duelling with their cameras, everyone wanting to get that special shot of the beach. Lunch was at Gortantoid Point at the eastern end of the beach. Iain entertained us with a few after lunch stories from Islay and in particular the region we were walking in. Then a short walk further north-east to one of the lowest trig points I've ever seen (according to the map at 24m), from here we turned south to Gortantoid. Time for the home stretch along the track past Killinallan and back to our cars. PS: There are two walks on Tuesday: A longer walk for the hardened walkers with Jack Adamson from near Gortaintoid (we're meeting 9:15 at Bridgend Auction Market at 9:15 for shared transport) through Glen Drolsay to Bridgend. A short walk with Walter and Beth Ramsay (very nice people, I think it's their first walk so please join them if you can and give them your support), meeting at 14:00 at Scarrabus for a walk to Loch Càm. I'll be on the long walk with Jack (sorry Walter and Beth), if you don't join me please make sure you go on Walter's and Beth's walk!